The default game of Minecraft doesn't really have much of an elemental rock-paper-scissors gameplay element. 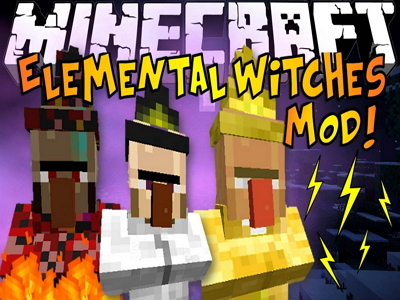 This particular mod seeks to alleviate this with the additional of several elemental, Christmas-, and Halloween-themed, witch mobs and similar pets.The Elemental Witch mod for Minecraft adds the following content to the game of Minecraft: Witch Mobs. You can now encounter spellcasting witches that have 3-5 different attack forms, as well as a final attack that can only be performed when it’s low on health. * Fire Witch. Hurls fireballs (some of which explode), summons fire bats, and conjures lava beneath her. * Lightning Witch. Shoots lightning and paralyzing balls, summons a pair of lightning golems and thunderstorms, and occasionally calls down a bolt of lightning. * Air Witch. Blasts a multi-format air shot, summons a whirlwind, and creates a suffocating vacuum. * Earth Witch. Hurls dirt, conjures falling boulders and arrow-absorbing walls, traps you in a box with two earth golems (and are only weak to a pickaxe). * Light Witch. Shoots bolts and balls of lightning, conjures armor, and can summon a healing minion. * Dark Witch. Shoots projectiles, creates a healing minion, summons minions that summons other minions, and conjures an explosive void crystal. Pets. You can come across eggs of various elementally-aligned monsters. You can then hatch these eggs and evolve the monsters into various stages. Beyond just the elemental varieties, there is also a Halloween-themed pet.